Sometimes I feel like I'm in the minority when it comes to blogging since the sport is usually dominated by women. I have a greater appreciation for Louisa May Alcott being the only woman in the Authors card game now. I have addressed this topic once before when I wrote about Manly Blogging. I'd like to take this topic a step further and highlight some other male bloggers I may not have mentioned before. It's time to give back or pay it forward or whatever you call it. Here are 4 men's blogs you should check out if you haven't already. Cheeseboy- Is a school teacher and is a talented writer. I am fairly new to his blog, but I really enjoy his style of humor and he makes me laugh. He recently got a ton of followers by doing a publicity stunt. 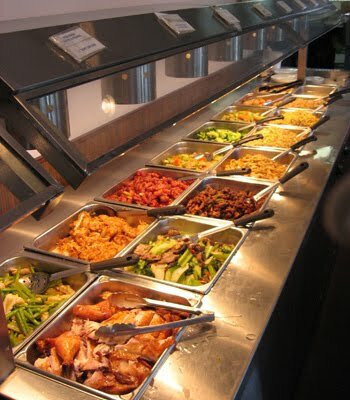 That kind of reminds me of when I had my stand off with the SWAT team until I got my 100 followers. You can check his blog out at The Blog O' Cheese. Eric- Is one of the smartest guys I know. He is very cultured and spends time jet setting around Europe. I'm pretty sure he knows the difference between Doric, Ionic, and Corinthian pillars. He's an artist, musician, linguist, craftsman, and an all around Renaisannce man like Leonardo Decaprio. I mean Da Vinci. He has the brains of Rick Steves combined with the Coolness of Indiana Jones. If you ever want to learn something new check out his blog at Bored Neoclassical Guy. Calvin- Is one of the most prolific bloggers I know. He is constantly posting a wide variety of topics, but I've noticed several re-occuring themes like super heroes, octopuses, kittens, politics, etc. He's not afraid to speak his mind. He posts so much material that I have accused him of being multiple people. You can check out his blog at Calvin's Canadian Cave of Coolness. Captain Mystery- This guy really is mysterious. It is nice to finally find someone who makes my weird thoughts seem normal. I was shocked to recently see that I am still his only follower. He keeps his posts short, sweet, bizarre, and funny. The best analogy I can make for his blog would be "Christopher Walken reading fortune cookies" See for yourself at Captain Mystery. There you have it. 4 guys who prove that men can blog too. I consider myself to be a positive and optimistic person. 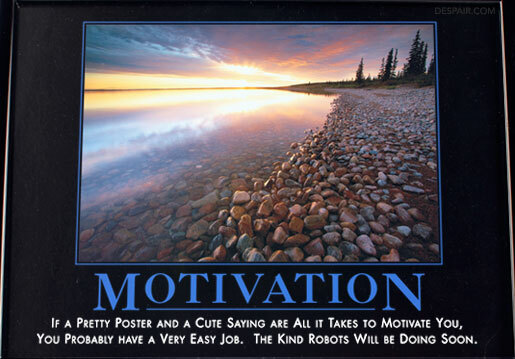 I am always up for a motivating message, but sometimes motivational posters can go overboard. I always get a kick out of the de-motivational posters that Despair, Inc. produces. Here is one of my favorites. During college I took a music appreciation class. I am the furthest thing from a musician, but it was informative and I really enjoyed it. One of the more memorable pieces we studied was Berlioz' Symphony Fantastique. There is a part in the piece which depicts a witch and a beheading. My instructor pointed out the Dies Irae melody during that song. Dies Irae means "day of wrath." It is a Latin hymn that was later adopted as a death mass. It is quite old, and I have been surprised how many movies I have heard the basic melody in over the years. It is not as common as the Wilhelm scream, but once you are familiar with the melody, it jumps out at you and you will start to hear it all over. One of the first musicians to use it was Paganini. He was such an accomplished violinist that it was rumored that he sold his soul to the devil in order to play the way he did. He incorporated the Dies Irae into some of his pieces, which only furthered the rumor. Other classical composers who have utilized it in their music are: Berlioz, Mozart, Liszt, Respeghi, Britten, Saint-Saenz, Tchaikovsky, and Rachmaninov. 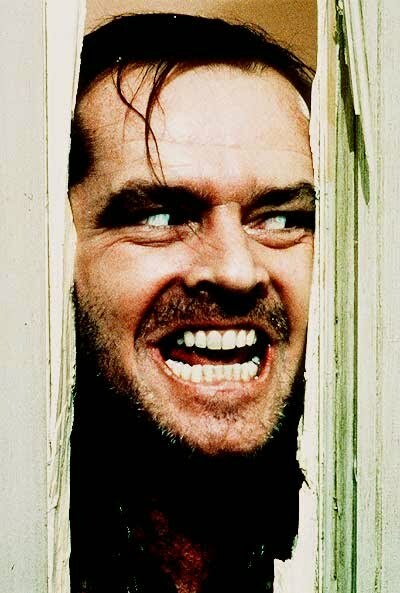 Today this theme is often associated with many horror movies and even some not so scary films. After hearing it many times in movie soundtracks, I started to keep a list. (No, not for an any assignment. I'm just a list guy). Here are some of the movies that use the melody or a variation of it at some point in the film. In case you aren't familiar with it, here is an audio clip link where you can hear it. I am always trying to expand my list, but I can only watch so many movies. Next time you hear this theme in a movie, let me know in the comments section so I can add it to my list. I try not to re-run posts, but I never got any feedback from this on my movie blog and thought more people could help me if I posted it here. I have always been a fan of basketball and slam dunks ever since I saw Dr. J on TV when I was a little kid. One of the greatest moments in my life was when I finally able to dunk a basketball as a sophomore in High School. I'm sure many people won't be able to relate to this (unless you are a drug addict), but dunking can give you a high, like a drug. I used to have decent jumping ability for a skinny white boy although I couldn't do all the tricky windmill, between the legs stuff you see young punks doing these days. During High School, College, and even into my early thirties when I'd play pickup games, I would usually average several dunks each outing. Over time my vertical jump decreased and dunking became less frequent until the year 2006 when the unthinkable happened. I went the entire year without getting a dunk. I could still occasionally dunk a ball if I was stretched out and it was a bouncy floor, if I had a tail wind and if the moon and stars were aligned, but my days of being able to throw it down on someone during a game were gone..
My drought has now extenended to it's 4th year and I am now taunted by the depressing thought that maybe it is time to just rely on layups and finger roles from now on. 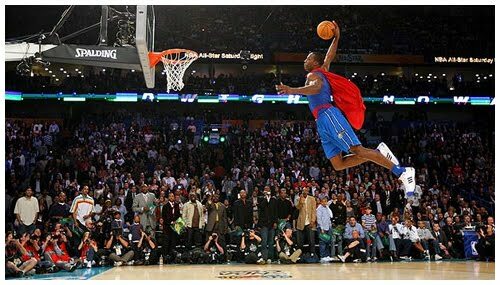 Is is possible for a soon to be 42 year old injury prone man to regain his hops and start dunking again? I think it's possible but not very likely. Some might interpret this as yet another mid life crisis or some kind of trivial obsession, but I'll bet those people have never felt the rush you get from dunking. It's a guy thing. It's kind of like harnessing the power of Niagra Falls and combining it with the excitement of killing a Sith Lord with a light sabre. Don't even pretend you don't know how good that feels. Here is a sample of what I'm talking about. If I can make a return to peak jumping form at my age, I would feel like George Foreman coming out of retirment and winning the heavy weight championship. Not that any of you care, but I think mentioning this in public makes me more accountable to start doing something about it. I will keep you posted when I reach this goal, or if I fail I will just pretend that it was never that important for me and I will simply delete this post. This is one of my favorite performances from Flight of the Conchords. If you haven't heard of them or if you've never seen this, you should give it a listen. I think Jermaine Clement and Bret McKenzie are two talented and funny dudes. It's kind of long but it gets funnier the further it goes. I can't vouch for all their work, but I endorse this particular Youtube clip as being worth your while to watch. I can almost guarantee it will make you laugh and you will feel better after watching it. 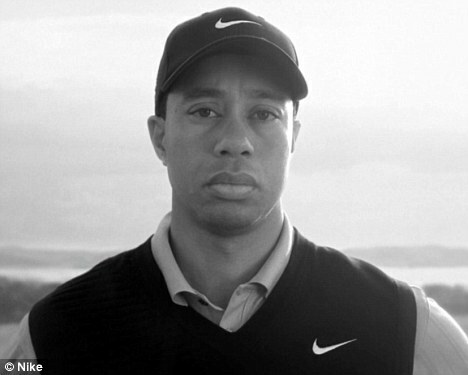 I am not a golfer and was never big a Tiger Woods fan, but I previously thought he was a pretty cool guy. It has been five months since his scandal broke and I figured the news outlets would have gotten this out of their systems by now, but I was wrong. I am getting sick of hearing about him lately. A few days ago while driving in my car, the news updates kept flashing breaking news about his return to golf every 15 minutes. They even had a special theme song they would play every time it came up. I can understand making a theme melody for major events like 911, presidential elections, war updates, etc. but not for one guys return to golf after several months off, even if he is the greatest golfer of all time. They kept interviewing other golfers for their opinions and everyone was so concerned about what kind of reception he would get from the fans. WHO CARES! Yesterday he got more air time on the news (from what I could hear) than the mining tragedy in West Virginia and I wasn't listening to sports radio either. It's not that I'm angry at Tiger Woods for his behavior or for letting fans down, although I think it was the dumbest thing he could have done. I am mad at the news stations for giving this story more attention than they would if earth were to be attacked by Martians. I guess my gripe is also with the sport of golf. It seems kind of wimpy to be called a sport. It conjures up images of silly nickers and drinking champagne in the clubhouse more than it does athleticism. Everyone who plays it swears that it is the greatest thing since sliced bread, but I just don't get it. I respect the skill levels, talent, and mental focus that the game requires, but it bothers me that pro golfers make so much money and don't even break a sweat. I would be a huge golf fan if there were American Gladiators running around on the course taking people out while they were trying to golf or if Vince McMahon was in charge of the sport and classed it up a little, but it just doesn't appeal to me in it's current state. 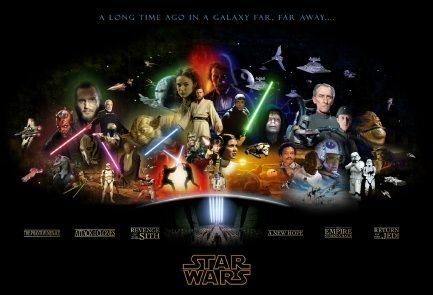 I try not to publish the same posts on my different blogs, but I recently did a post on The Movie Guy about Star Wars and since I only have 7 people who read that blog, I thought I'd get more input by posting it to Chaka's World. I don't consider myself a Star Wars geek, but like most Americans, I'm familiar with the characters in the series that George Lucas has made household names. I'd like to share my thoughts on some of them. 5. Chewbacca- The name, the fur, the crossbow, the wookie yell. What's not to like? 4. The Imperial Guard- Despite being bad guys and having a very minimal roles, these elite red storm troopers are some of the coolest and most mysterious characters. 3. The Darths- This includes Sideous, Vader, and Maul. If your first name is Darth, then you can probably expect a career with the dark side of the force. 2. Boba Fett- This bounty hunter is a stud. I would have liked to have seen more of him. 1. Obi Wan Kenobi- I like both the original Alec Guiness and also the younger Ewen McGregor version. I think it is probably has something to do from the inflections of his voice. My all time favorite Star Wars line is "These are not the droids you are looking for". Using Jedi mind tricks has gotten me out of traffic tickets, speaking in church, and jury duty. Han Solo- I am a big Harrison Ford Fan, but the tough rebellious guy who pretends not to care act gets old after a while. Yoda- I know he teaches some great wisdom like "Do or do not, there is no try", but he is also guilty of being a Muppet and saying things like "Good Relations I have with the Wookies." 5. Queen Amidala- R2D2 expresses more feelings than her. She is emotionless, sad, and depressing. 4. Battle Droids- These guys are absolutely worthless. They are about as threatening as a slinky and all they do is get sliced to pieces by light sabers. The coolest thing they do is come out of storage. 3. Ewoks-I didn't go to the theater to see jungle Care Bears in space! 2. The blue elephant, and long lipped singer who perform at Jaba's lair. Why throw in such dumb puppets that detract from the coolness of the movie? 1. Jar Jar Binks- No surprise here. I never would have thought that another Star Wars character could make C3PO look cool. Any characters you like or dislike that I may hve missed? Opening this up to discussion is kind of like my version of a book group discussion. It may not be Shakespeare, Austen,or Steinbeck, but at least I can follow the story line and the special effects are way better too. Over the years I have tackled a variety of random topics. I have never categorized my posts on this blog so I thought I would list some of the different categories I've addressed which you can find in my blog history. Hopefully there is a topic that will appeal to everyone. Evil Twins, James Bond, Depressing Saturdays, Acronyms, The Worst Candy Ever, The Enneagram, Number Combinations, Video Games, Sneezing, Lame songs, Word Pet Peeves, Rival Movies, Time Travel, Grumpy Old Man, Vegetarians, The Man Purse, Christmas Decorating, Facial Hair, Super Heroes, Car Repairs, Role Models, Tipping, Drug Commercials, 80's Music, Gas Prices, New Years Resolutions, Secret Agents, Musicals, Adsense, Crossing 7's, Greatest Dunkers, Embarrassing Moments, Before and After Pictures, Valentines, Manly Blogging, Ugly Cartoon Characters, Sign Holders, Getting Paid not to Grow Crops, 2012: End of the World, Shoe Tying Efficiency, Lava, The Thesaurus, Black Hairy Tongue, Do it Yourself Haircuts, The Onion, Plasma Donating, Computer Woes, Classical Music, Camping, Nuts, Egging, Haiku Contest, Chiropractors, Answering Machines, Left/Right Brained, Jacuzzi Fears, Home School, All Star Wrestling, One Hit Wonders, Socks, Dejunking, Tattoos, Vin #’s, Bread, Feng Shui, Chain Letters, Wholesome TV, Telemarketers, Dental Woes, Canada, How to Dry After Showering, Prince, MRI Machines, Pens vs. Pencils, Bogus Stats, Disneyland, Subliminal Messages, Armed Forces, The Far Side, Eyebrows, Movie Pet Peeves, Popsicles, Eye Floaters, Junior Mints, Chickens, Scooters, Marathons, Shaving, Scientology, Food in Bulk, Nostradamus, Puffy Sleeves, Muscle Posing, Nose Blowing, Nasty Carpet, Cell Phones, Modern Art, Celebrity Endorsements, Cold Weather, Bear Grylls, MMA, Olympics, Funny Basketball Team Names, Name Brand vs. Generics, and Bumper Stickers. It would take me a week to create links to each one of these, so just type a topic in the search box if any of these appeal to you and see what comes up. You can just pretend you are on a small version of the Internet. Sometimes I struggle coming up with topics to write about, so if you have any suggestions feel free to let me know.